Toe Curlin’ Kiss broke his maiden Friday at Laurel Park. Photo by Jim McCue, Maryland Jockey Club. Barbara Houck’s Toe Curlin’ Kiss, making his fourth career start and first as a gelding, proved best in a field of six that included pair of high-priced rivals to graduate in style with a 1 ¾-length victory Friday at Laurel Park. Ridden by apprentice Reylu Gutierriez in his first start for trainer Donald Barr, Toe Curlin’ Kiss ($11) was unhurried racing third behind front-runners Smart Step and March Screamer after a quarter-mile in 23.69 seconds in the $40,000 maiden special weight for 3-year-olds and up. Tipped three wide leaving the far turn following a half in 47.72, Toe Curlin’ Kiss reeled in Smart Step at the top of the stretch and edged clear to win in 1:24.01 for seven furlongs over a fast main track as 4-5 favorite Flying the Flag – a $675,000 son of Malibu Moon – made a belated bid for second, one length ahead of Smart Step. Lane’s End Racing’s newly gelded 4-year-old Formula One, purchased for $1.7 million as a 2-year-old in training in 2016, trailed throughout and finished last in his fifth career start for Hall of Fame trainer Shug McGaughey. Toe Curlin’ Kiss, a sophomore son of two-time Horse of the Year and 2014 Hall of Famer Curlin, went unraced as a juvenile after fetching $93,000 at Fasig-Tipton’s Midlantic 2-year-old in training sale in Timonium. Winless in his first three starts this year for previous trainer Graham Motion, including a runner-up finish last out Aug. 4, he tuned up for his return with a bullet five-furlong breeze in 1:00 Sept. 29 at Laurel. In 2013, Houck purchased a daughter of Curlin named Stellar Wind, for $86,000 out of Fasig-Tipton’s Midlantic fall yearling sale. Stellar Wind made her first two starts at Laurel for Houck and Barr, breaking her maiden Dec. 18, 2014. Sold privately to Hronis Racing following her maiden triumph, Stellar Wind would go on to be named champion 3-year-old filly of 2015 and win 10 races, six of them Grade 1, and $2.9 million in purses before being sold for $6 million at Keeneland’s November 2017 mixed sale. 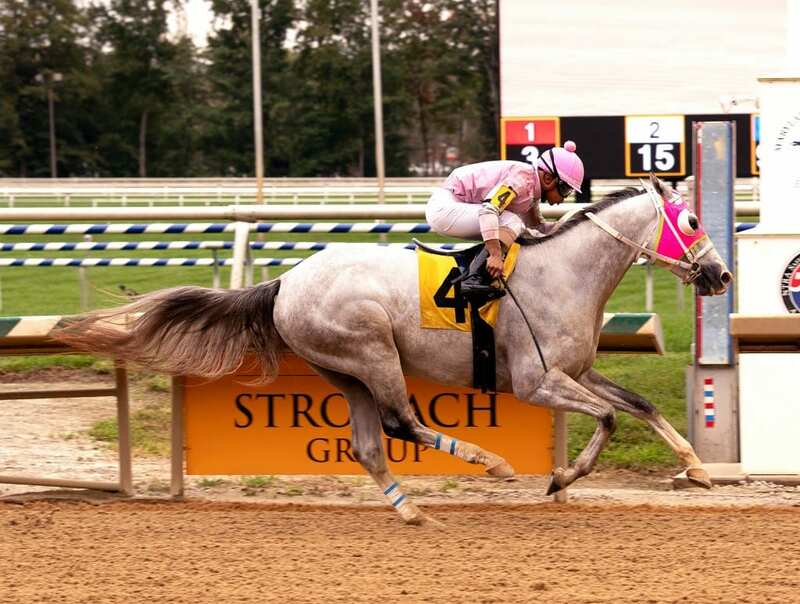 Racing second time off the claim for trainer Lacey Gaudet, Standing Rock Farm’s Punch Line Stakes runner-up Divine Interventio ($4.40) cruised to a five-length win in 1:22.28 for seven furlongs in the first of three allowances to cap Friday’s card. In the late double, both rained off the turf, Douglas Road ($5.80) earned his second straight win in his main track debut in Race 9, and favored Keep Your Distance ($4.40) won for the fourth time in five starts in Race 10.